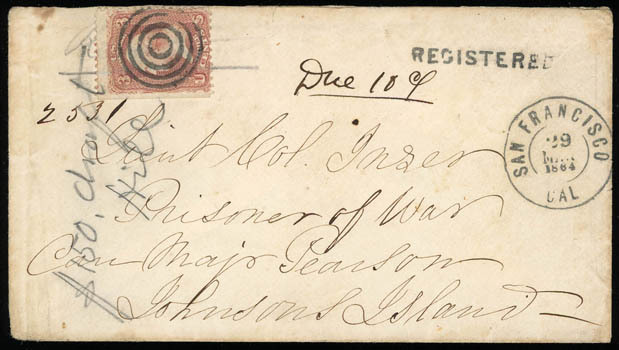 Confederacy, Johnsons Island, Sandusky, O., incoming cover addressed "Lieut Col. Inser, Prisoner of War, Care Major Pearson, Johnsons Island", franked with 1861, 3¢ rose (natural s.e.) cancelled by target, matching "San Francisco, Cal. Mar 29, 1864" cds and straight line "Registered" handstamp, manuscript "Due 10¢" and endorsed "$150 draft, Hill" in pencil at left additionally tying stamp, Very Fine. 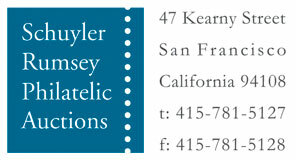 A VERY RARE REGISTERED LETTER FROM SAN FRANCISCO, CAL. TO PRISONER AT JOHNSON ISLANDS. Registered mail service was available in the United States during the war years of 1861 to 1865. Registered letters known to prisoners contained money and by registering the letters, they were guaranteed delivery to the prisoner. 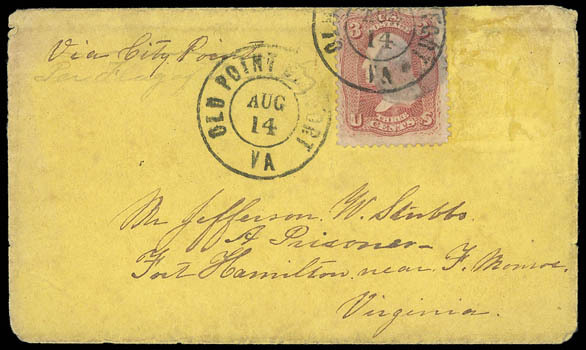 Confederacy, Chesapeake Military Prison, Camp Hamilton, Virginia, on yellow Prisoner of War cover bearing 1861, 3¢ rose tied by "Old Point Comfort Va. Aug 14" double circle date stamp, addressed to "Mr. Jefferson W. Stubbs, A Prisoner, Fort Hamilton near F. Monroe, Virginia", gum residue for C.S.A. stamp removed as mandated (not always followed) when it crossed South to North, endorsed "via City Point" and underneath in light pencil "Per Flag of Truce", flap faulty and some edge wear, Very Fine, ex-Warren. HARRISON LISTS ONLY THREE COVERS KNOWN FROM THIS RARE FEDERAL PRISON. Stubbs was a prominent citizen and former County Commissioner of Gloucester County Va. He was described in a petition signed by numerous citizens of the county as an elderly gentlemen guilty of nothing more than being the father of three sons in the Confederate Army. He was released several months later after taking the oath of allegiance. The Chesapeake Military Prison was established in the summer of 1863 and operated until August 1865. It housed Federal soldiers incarcerated for various offenses as well as many civilian prisoners. 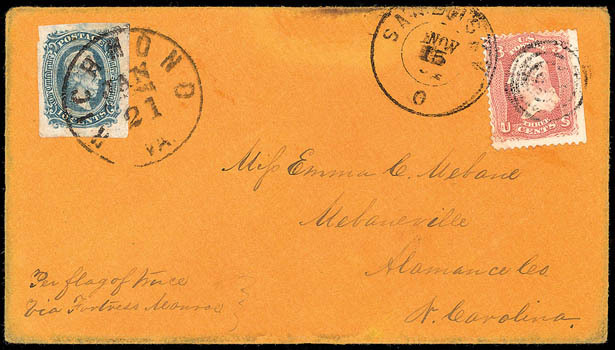 Confederacy, Johnsons Island, Sandusky Oh., Prisoner cover bearing 1861, 3¢ rose tied by "Sandusky O. Nov 15 '64" duplex and addressed to Miss Emma C. Mebane at Mebaneville, N.C., in combination with 1863, 10¢ blue, four large margins, tied by "Richmond Va. Jan 21" cds, reverse with "Prisoner's Letter, Johnsons Island O., Examined, GSB" oval examiner's handstamp, endorsed "Per Flag of Truce via Fortress Monroe"; minor edge discoloration, Very Fine, ex-Warren. This cover was sent by Capt. William G. Mebane of Company B of the 13th Tenn. Inf. who was captured as a POW at Marietta Ga. on June 27, 1864. The addressee was his cousin whom he later married in December 1865. Emm's father was Giles Mebane who was the Speaker of the North Carolina legislature during the war years. 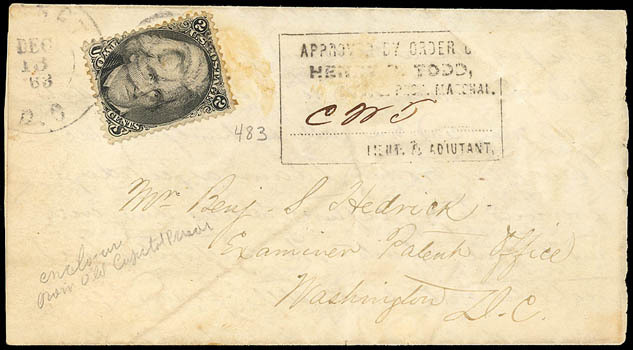 Confederacy, Old Capital Prison, Washington, D.C., prisoner of war folded letter datelined "Old Capitol Prison", addressed locally to a past acquaintance at the Patent Office, franked with well centered 2¢ black (73), some light gum toned perfs at top, tied by "Washington D.C. Dec. 16 '63" cds duplexed with target cancel, boxed "Henry R. Todd" Provost Marshal's Office examiner handstamp (Harrison box type Ia) with manuscript "CWT" initials (Charles W. Thompson); right portion of lettersheet missing, Very Fine; with 2009 P.F. certificate. A VERY RARE BLACKJACK USAGE PAYING THE DROP RATE FROM OLD CAPITOL PRISON BEARING A RARE PROVOST MARSHALL EXAMINER'S MARKING.